The Nia 5 Stages are an integrative movement practice based on the five stages of human development: Embryonic, Creeping, Crawling, Standing, and Walking. We begin in embryonic and move through each of the 5 Stages consecutively, without thinking, seeking the sensation of pleasure. This allows you to sense the natural ability your body has to realign itself and self-heal through movement. Practiced with awareness, these stages have the power to facilitate optimal alignment, improved function and comfort in the body. Whether practiced at length or for as little as five minutes a day, this system provides a tool for reclaiming and sustaining mobility, flexibility, strength, agility and stability. This transformational work will connect you more deeply to the magic and wisdom of the body that is dedicated to healing. The Body's Way, the science behind Nia, provides a map to explore function and use of body parts. This unique map provides the information you will use to help organically re-pattern and re-structure your body. The object of practicing the Nia 5 Stages is to prepare the body to become more functional, energetic, and comfortable while moving, dancing Nia, running, or while in yoga postures such as downward dog, spinal twist, forward bend, or child's pose. Used individually, each stage of movement gives you the opportunity to feel and sense body parts that may need a little healing attention, and to feel and sense physical places that need to be opened, softened, strengthened, and more aligned. Practicing every day on your own will vastly accelerate your healing and transformation process. Take pleasure in allowing your body to move on its own by witnessing how your body moves you! about this Nia movement practice. or you may contact me using the contact form. 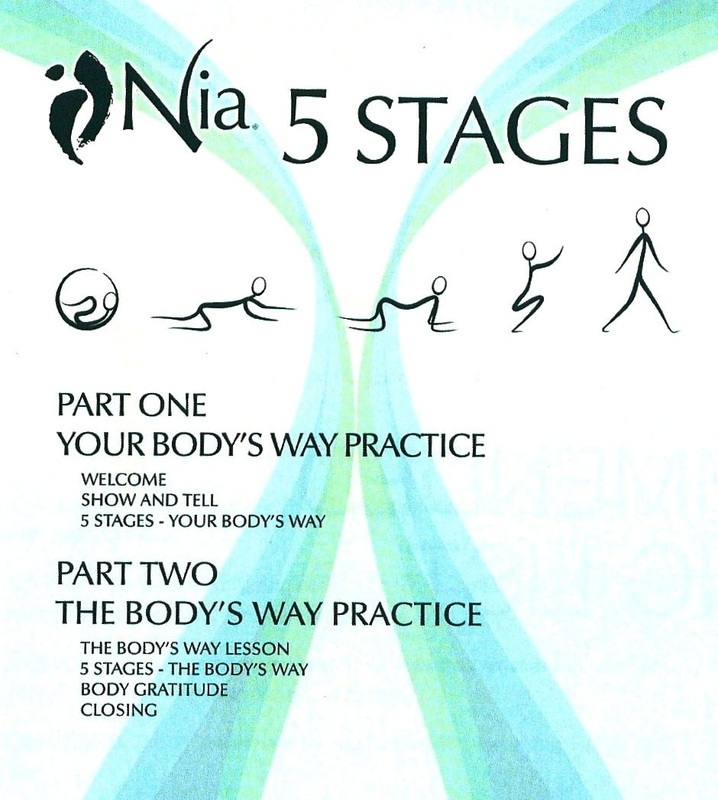 to indicate you are interested in the Nia 5 Stages.